Caves are environments, not dioramas. People walked through them, and they were used for, you know, purposes. The Lascaux replicas are some sort of dioramas. A diorama usually has a distinct educational purpose, it tries to show us something we otherwise wouldn’t be able to see. Caves are also very real. The caves themselves are not simulating other caves. The decorations, or interior design, do seem to simulate nature in a lot of cases, and can have an undeniable immersive effect. The big Lascaux hall with its ceiling of running animals might be a bit diorama-like, though it doesn’t represent a ‘real’ situation. Dioramas connecting to prehistoric natural architecture seems to lead to a conceptual dead end (or does it?). Caves are natural architecture, and I wouldn’t be surprised if they were the blueprint for all following human-made buildings. Altars, especially the baroque altars, but also stage design, and theatre and movie sets have a much more diorama-like presence. Altars are symbolic dioramas, representing not elements from reality, but visualize a way to get closer to god, or gods, or the afterlife, or enlightenment, or redemption. But they were also used, at least some parts of altars would get meddled with while performing rituals. Decors and sets only really are dioramas when they’re not in use. Once a play is being carried out on the stage, a set looses its frozen-in-timeness, and becomes part of a time based narrative. Actors interact with the decor, and the diorama is lost. When abandoned, a theatre decor could very well be a diorama, albeit a handicapped one, since it’s missing its context of story and actors. Can a decor on a stage be a diorama in its own right? De Efteling is a fairy tale themed amusement park, and according its own website it has only one diorama: an elaborate miniature set of mountains and villages through which miniature trains travel. In fact, Efteling has a staggering amount of dioramas, and most are more or less brought to life using animatronics. The oldest part of the park is the fairy tale forest, which was built around 1950, where visitors can look at sleeping beauty in her coffin through glass windows, her breathing simulated by an air pump. 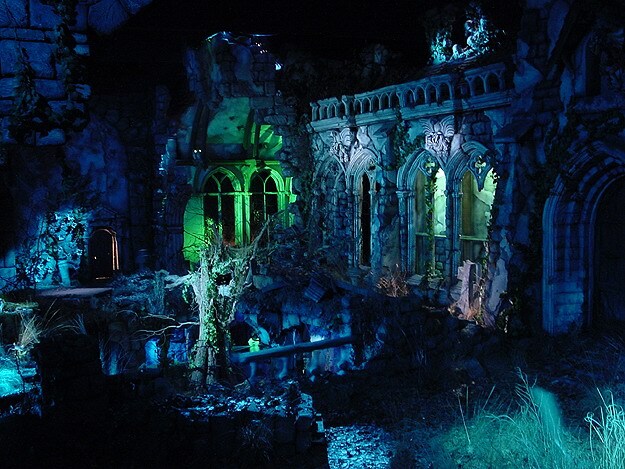 A bit further is a haunted castle (Spookslot), where every fifteen minutes a show takes place: Saint-Saëns’s ‘Danse Macabre’ accompanies a choreography with animatronic red-eyed bats, skeletons and dancing tombstones, and a clever mirror and lighting illusion of holographic ghosts dancing in a cellar. There are also video registrations of the show, for instance this one by YouTube user Eftelwesley. I probably need to explain why I’m talking about theme park Efteling: in the Netherlands, the Efteling is a standard component of virtually anyone’s childhood. For an adult, it can simultaneously be incredibly annoying and eerily enchanting. The special effect rides are up to Hollywood standard, only with less bling. All over the park, (sickening) music is added to enhance the fairy tale atmosphere. On the other hand, the outdated technology of some of the attractions in the park, and the overall kitschiness are part of its charm. It does bring out the kid in an adult. In 2015, the gallery I had been working with for years celebrated its tenth anniversary. The gallerists asked their artists what we preferred to do: go to the Efteling, or another option which I forgot. Without any exceptions, all artists opted for an Efteling visit. And so we went. We had a good time. Photo by Lana Mesić. 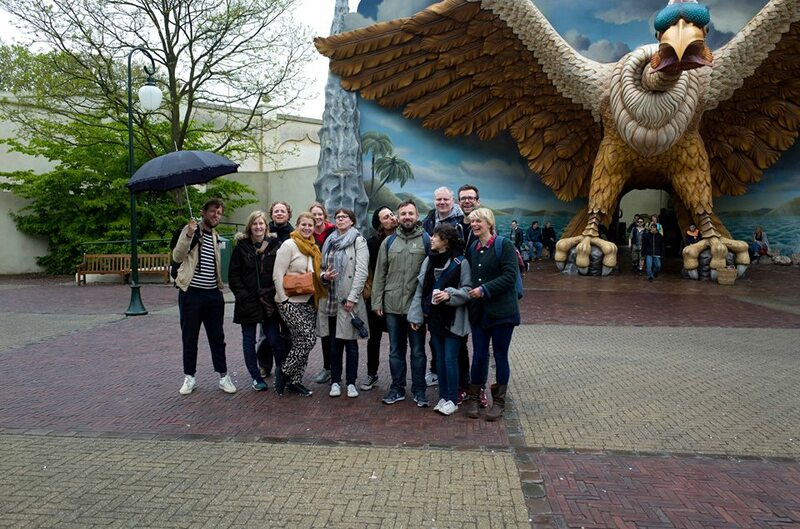 With Daan Paans, Marleen Sleeuwits, Pierre Dirks, Sarah Carlier, Geertje Muffels, Alexandra Crouwers, Christian Kryl, Rob Wetzer, Sjoerd Knibbeler,Karianne Bueno, and gallerists Geertje Muffels and Robert Jan Verhagen in front of Efteling’s Vogelrock (an indoor rollercoaster), 2015. Due to the sometimes dated animatronics, a lot of the park is slightly uncanny, and in various cases straight out kitschy. There are some serious problems with the way many of the fairy tales are being pictured, and I once had a discussion with their costumer service about these issues. The park holds on to the depiction of the fairy tales as the original park designer – an illustrator – had visioned them in the 1940s and 50s, a vision that in itself was based on 19th century British romanticism. Because of this, some of the dioramas display extremely outdated ideas about gender equality, or terribly stereotyped notions on ethnicity. Wikipedia: A dark ride or ghost train is an indoor amusement ride on which passengers aboard guided vehicles travel through specially lit scenes that typically contain animation, sound, music and special effects. One of the attractions, the immersive ‘dark ride’ Droomvlucht, built in 1993, has several dioramas the visitor admires from the comfort of a cart following a route through a building (note: although the cart is moving, it’s not moving through the dioramas, but rather passes them by). The scenes are loosely based on Oberon, ‘the king of the fairies’ originating in 13th century Merovingian texts: an ‘elven-man of the forest’. 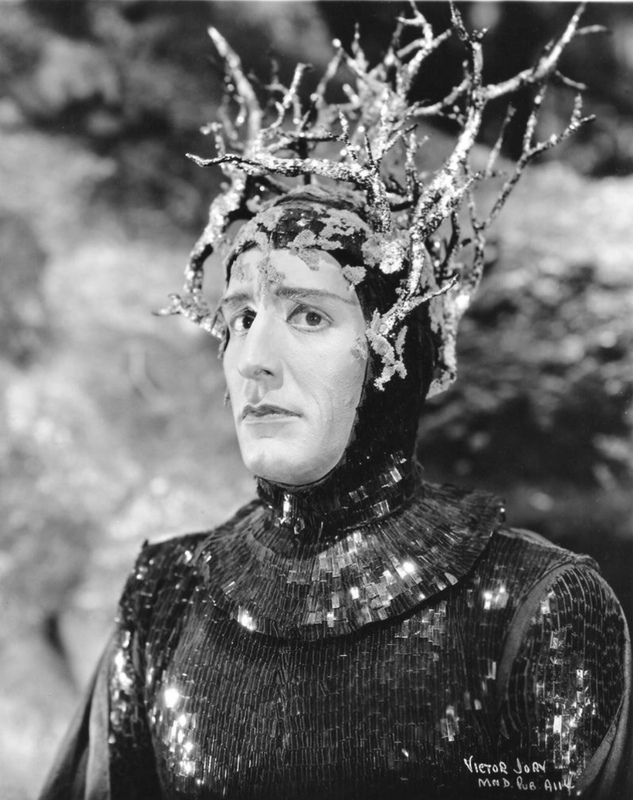 Shakespeare’s Oberon from ‘A midsummer night’s dream’ is a trickster elven king, arguing with his wife, the elven queen, over the custody of a child. Efteling has turned ‘Oberon’ and his elven kingdom into a segregated society: female fairies ‘live’ mostly in separate dioramas from the male trolls. Oberon seems to be the only male elf, which is weird in many ways. All (women) elves are blond or have light brown or pastel-colored hair – they’re all very white – have blue or green eyes and are dressed in pastel-coloured ballet-like dresses. They don’t really do anything but sit on branches or swings. The trolls are a bit more engaged in activities (playing, bathing, risk-taking by swinging on one hand). They mostly wear loin cloths, and are a bit less white-skinned than the elven girls – consistent with the idea that men work outside and get tanned in the sun, while women are confined to an indoors golden cage life. At the start of the ride there’s a larger young and fresh looking woman in a pond – the elven queen, then? – and in one scene, there’s the elven king, old and crooked and surrounded by young, white women-elves, on a throne, waving. There also seems to be a ‘race’ of green people with pointy ears. No idea how they fit in, but there they are. This is the so-called ‘onride’ of Droomvlucht, a registration by De Efteling. Warning: some may feel it’s hard to stomach, but it helps if you turn off the sound. After visiting the park the last time, when I also went for the dark ride of Droomvlucht, I felt the need to write a comment to the Efteling, since the message that the dioramas conveyed were not of the sort that I would want to promote as a theme park in the 21th century. Although I do appreciate a certain traditionalism when it comes to fairy tales, sagas and myths, I’m convinced that with minor adjustments such tale can be transformed into something more inclusive, both concerning gender and ethnicity, culture or skin colour. Suggestions: put a female fairy queen right next to the fairy king. Spray paint the fairies in various skin tones, replace their eyes and wigs, have them wear pants and boots and bows and arrows and dresses. Mix the trolls and the fairies in the dioramas more: trolls can be female too, and fairies can be male. Since most of the diorama’s appeal lies in the meticulously decorated nature scenes and its unearthly lights and colors – including even science fiction planet scenes – these are small changes, conveying a big message. Side note: my significant other’s argument that ‘children won’t notice it anyway’ is invalid. They might not actively notice it, but the ride reaffirms gender stereotypes in a really not so subtile way. Of course they won’t ‘notice’ it, but it’s definitely part of an overall framing. The Efteling welcomes over 5.000.000 visitors per year. Dutch right wing nationalist politician Geert Wilders has a favorite Efteling ride, Droomvlucht. It led to these two journalists making their own rather hilarious – and interesting – Droomvlucht analysis, in which they’re talking about hyperrealities and a desire for the impossible, but appear to miss my points. De Efteling heeft in juni het sprookje ‘Het Bruidskleed van Genoveva’ in het Sprookjesbos aangepast. Sinds juni 2018 zie je geen gekleurde duiven meer rondom het Herauten Plein, alleen nog maar witte. Hoewel de duiven altijd met een diervriendelijke verf gekleurd werden, vindt de Efteling het niet meer van deze tijd. Dus is besloten te stoppen met het kleuren van de duiven. In het begin van het sprookje ‘Het Bruidskleed van Genoveva’ zijn de duiven nog wit. Dat fragment wordt nu uitgelicht in plaats van het eindfragment met de gekleurde duiven. If they can change the colors of the doves to ‘normal’, you can change skin-colors and outfits of characters to ‘normal’, too, right? Wikipedia: The Eidophusikon (Greek: Ειδωφυσικον) was a piece of art, no longer extant, thought up by the English actor David Garrickand created by 18th-century French painter Philip James de Loutherbourg. It opened in Leicester Square in February 1781. Described by the media of his day as “Moving Pictures, representing Phenomena of Nature”, the Eidophusikon can be considered an early form of movie making. The effect was achieved by mirrors and pulleys.